Staff were friendly and helpful. MY ROOM WAS IN GOOD CONDITION. Downtown Edmonton which has Rogers Place, great shopping, awesome restaurants & Art Gallery of Alberta. 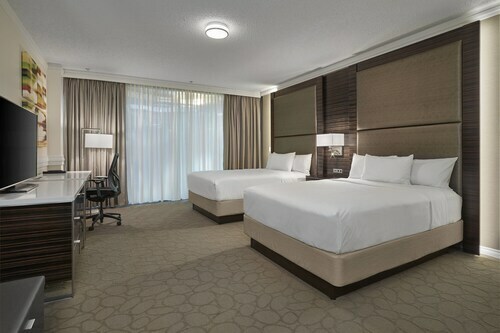 If you are looking for a clean, comfortable hotel in the heart of downtown Edmonton at an affordable rate the Delta Hotels by Marriott Edmonton Centre Suites is a great choice. Chateau Lacombe Hotel in downtown Edmonton is my favourite hotel to stay for accommodation while in Edmonton. However, would still recommend the Chateau to people wanting to stay in downtown Edmonton, the location is great. Overall it was a great experience and I would recommended this hotel if you're staying in downtown Edmonton. Welcome to Downtown Edmonton, a cultural hotspot that’s always full of life. Whether you’re here to indulge in the vibrant nightlife or explore the artistic side of this great city, the downtown area has something for you. Get ready for some genuine excitement, because you’ve never seen anything quite like Downtown Edmonton. Visit the Edmonton Symphony Orchestra, the Art Gallery of Alberta, and Churchill Square. Break out your credit card and get some serious shopping and eating done at Jasper Avenue, where you’ll find countless stores and eateries lining the street. The city is broken into several districts, which you can explore at your leisure. Walk past the Alberta Legislature Building to see the provincial government in action. If politics isn’t your thing, stroll through the Legislature Building’s park and fountain-lined grounds for quiet reflection. No matter what district you choose to stay in, you’ll have a comfortable home base to return to after your various daily exploits. Relax in your hotel and summon room service on those days when it’s just too taxing to leave your bed. Larger downtown Edmonton hotels may have one or more on-site restaurants and cafes for you to investigate, and you’re sure to relax and kick back after a steaming stay in the sauna. Read a complimentary newspaper with your morning coffee, and don’t forget to get your clothes pressed at the on-site laundry facilities. Come to Expedia.ca when you need hotels in Edmonton or anywhere else. We offer the best rates for any sort of lodging, whether you’re after a plush suite or a basic room on your way through town.